As we conduct training using some form of multimedia, we will add them to this page. They are for informational purposes only. The Firefighters Support Foundation (FSF) is a 501(c)(3) non-profit organization with the primary mission of developing advanced training programs for firefighters, EMS and S&R personnel, and providing these programs at no cost to these professions. FSF programs usually take the form of a video presentation and an accompanying Powerpoint presentation, thus providing a complete program for individuals and a turn-key training module for agency trainers. Download free firefighter training courses courtesy of the Fireighters Support Foundation. The National Fire Academy (NFA) is proud to offer the fire and emergency services community a new, more convenient way to receive training with NFA Online. Students can complete courses online anywhere and anytime convenient to them. The Emergency Management Institute (EMI) offers self-paced courses designed for people who have emergency management responsibilities and the general public. All are offered free-of-charge to those who qualify for enrollment. To get a complete listing of courses, click on Course List link. In this section you will find, free of charge, online training courses for fire fighters. These courses cover a range of important topics which are critical to fire fighter safety. Whether it's understanding a comprehensive fire approach or learning the hazards of lightweight construction, these courses are designed to educate the fire service on various fire behaviors, risks and codes. Select the course you are interested in from the Access Online Fire Service Training link on the left. Fire and arson investigation training. Resource for fire services, fire insurers, law enforcement and others whose duties involve arson investigation, fire investigation safety and fire scene training. Our online training center provides interactive tutorials on critical fire and arson investigation procedures. Our latest topic is First Response from an Investigative Perspective. This interactive tutorial will allow you to view the same incident from the experiences of fire, police and EMS professionals. The International Association of Arson Investigators (IAAI) has created this interactive training and educational network in order to share expertise and deliver consistent and credible courses or modules to investigators around the globe. We will be utilizing text, audio, video, graphics, animation and Virtual Reality. Some programs will be distributed via live Web-cast and then archived and distributed so that those who missed the event will still be able to take advantage of the content and receive credit for years to come. CFITrainer.Net® is designed to allow users to immerse themselves in content while working at their own pace. The IAAI and its partners will work to deliver unique learning experiences that are positive, challenging and fun. Improving Understanding and Collaboration among First Responders at Johns Hopkins Bloomberg School of Public Health. Intended for public service professionals who are first on the scene, these course materials explore how each subset of emergency professionals, like fire fighters, characteristically respond to an emergency as a group. Lecture slides lead independent learners through the class with the goal of encouraging better cross-responder cooperation and aligned service between groups. Students do not earn continuing or academic credit for this course, which includes an examination of strengths and weaknesses of individual and group performances, within each group as well as collaboratively. Introduction to Security at Weber State University In this non-credit class, course materials related to fire fighting and the security of physical premises from threats that include fire are available. Lectures focus on planning for fire emergencies and carrying out firefighting emergency plans, the fire fighting standards according to Occupational Safety and Health Administration, fire prevention, fire fighter safety and disaster planning. While students do need to get their own textbook, they can access reading assignments remotely. Wildland Fire Management and Planning at Utah State University Throught this course, independent learners increase their skill in recognizing and managing factors that influence what kind of speed and direction wildfires are likely to take. Web-published workbook pages, study guides and exercises that correspond to course units in topography, atmospheric conditions and moisture and how each of these factors relate to the behavior of a fire. This class requires that students have access to specialized software in order to access all available materials. The courses you will find here are designed to give you a basic understanding of the topics. These classes also serve as prerequisites for advanced training that the National Emergency Response and Rescue Training Center (NERRTC) provides in your jurisdiction. This activity offers proactive education on the most up-to-date information on state and local public health emergency response planning for radiological and nuclear terrorism incidents. Public health officials at the state and local levels requested additional guidance on adapting all-hazards state and local emergency preparedness plans for radiological and nuclear incidents involving mass casualties. In response to these requests, this course will provide public health officials with the most current information regarding public health planning for response to radiation emergencies, including information on local government roles and responsibilities, radiologic monitoring of people (population monitoring), pharmaceutical countermeasures deployed by the strategic national stockpile, and the role of communications in a radiation emergency. Michigan State University (Emergency Response Solutions), in conjunction with Industrial Safety Consultants, Inc., has developed several online Awareness Level training programs for public and private sector emergency responders. At this time MSU is offering ALL of these programs at no cost. Some of these programs can be used for required refresher training. Funding for these programs is generated through a federal grant. Electronic certificates are available for printing to those who complete each course with a passing grade. The MetEd website provides education and training resources to benefit the operational forecaster community, university atmospheric scientists and students, and anyone interested in learning more about meteorology, weather forecasting, and related geoscience topics. MetEd is populated and maintained by the COMET® Program, which is part of the University Corporation for Atmospheric Research's (UCAR's) Community Programs (UCP). A course designed by CSX to help local emergency responders manage incidents involving rail property and equipment. CSX is dedicated to managing safe railways, and by working together with professionals like you, we can better protect and serve the communities in which we live and work. Emergency response procedures require attention to detail. While this site is geared toward all responders, CSX provides discipline-specific training for police, fire & rescue, and other response agencies. TRANSCAER® (Transportation Community Awareness and Emergency Response) is a voluntary national outreach effort that focuses on assisting communities to prepare for and to respond to a possible hazardous materials transportation incident. TRANSCAER® members consist of volunteer representatives from the chemical manufacturing, transportation, distributor, and emergency response industries, as well as the government. We recently invited the National Weather Service to come out and give us a storm spotter class. We had a great time and learned a lot. It was a two-hour class and we were able to fit it in one Tuesday night. If you would like to have a weather spotting class at your school, church, or job, please let us know and we will put you into direct contact with the instructor. 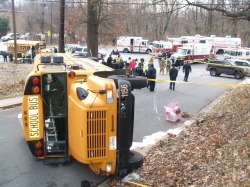 Over-turned School Bus Drill- Thanks to all who participated!!! The Priceville Fire Department does a lot of training. Recently, we had Air Evac come in and do a presentation on how to safely land a helicopter. We all learned a great deal from it and can use the information to make ourselves a better department. They also described some services they offer. If you have any questions, feel free to contact their director Mike McCurley here. Ana Franklin and Steven Ziaja recently visited the fire department. Ana and Steven provided some joint training between Priceville and Somerville Fire Departments on the dangers of Meth Labs. It was a good chance to look into the world of drugs. If you click on the picture to the right, it will take you to a website that highlights meth users. Move your mouse across the pictures at the top of the screen to see the physical effects of methamphetamine usage. Looking at the chemicals that go into meth, some of them alone can kill you. Just imagine what they can do when combined. Meth cooks/users are not concerned about their social impact, the effects on the environment, the dangers they present to themselves, the harm they can do to their kids, or the effects they have on the community around them. 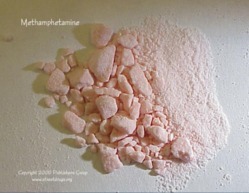 As methamphetamine production/usage is increasing, so are the hazards towards the fire department, EMS, and police. In 2009, 17 firefighters from Somerville were sent to the hospital after being contaminated while fighting a fire on an unsuspecting meth lab. Luckily, they all turned out to be okay. However, if they had been hurt, who would have paid the price for it? Unfortunately, it would have been the fire department, firefighters, and the community in the long run. *It is a toxic environment to children. Products are stored in the same location as their food and toys. *Combined, the chemicals are explosive. *The state of Alabama has no laws to enforce decontamination of dwellings prior to them being re-rented. Think about that the next time you rent a house or stay in a hotel. *The environment takes a hit. Do you think they try to save the chemicals they discard to prevent harming the environment? They typically burn their waste as to prevent having evidence turn up in their trash. If you believe there is suspicious activity going on, call Alabama’s ANONYMOUS methamphetamine hot line at 1-800-392-8011. The following is some really good training from the National Fallen Firefighters Foundation. You can order a resource kit from HERE. You can only order a resource kit from HERE. Below is the basic layout. The actual training provided will vary from instructor to instructor.